Discussion in 'Public Events' started by Lina, Apr 21, 2018. Green Dragon Friday is 10 years old, and we must celebrate! This is the main party! Welcome hobbits! Bring all yer hobbit friends! The Grand GDF Anniversary Play – a short theatrical play! The Grand GDF Anniversary Meal – 10 courses? The Grand GDF Anniversary Speech – short and sweet! Round two of the Grand GDF Raffle – win fun and grand prizes! The Grand GDF Fireworks Display – boom! Please note that Green Dragon Friday is an in-character roleplaying event for hobbits. Travelling dwarves are welcome as always. 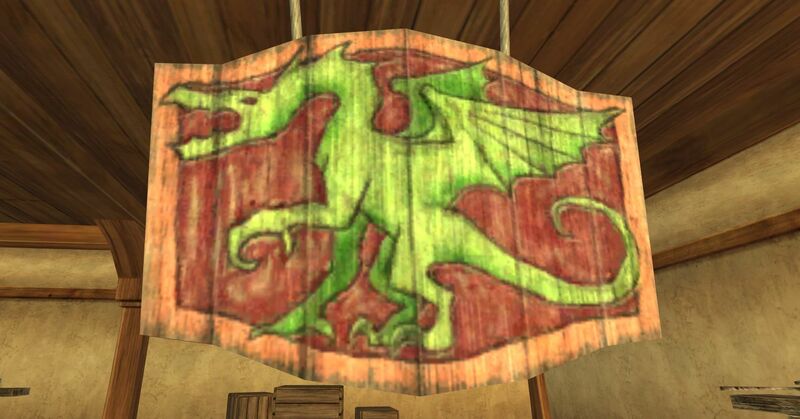 Friday May 11 we celebrate 10 years of Green Dragon Friday, the weekly roleplaying event for hobbits on Laurelin. Every year, we draw up a grand meal that the hobbits can order from Barmy at the bar. This year, I figured we’d announce the menu in advance, so yer can find yer favourites before the event. Or order them all, ‘s up to yer! This year, the theme is “Food from the Shire Villages”. So we offer ten courses from different locations across our lovely homeland, with dishes inspired by the villages they hail from. Hobbiton: Mushroom, goat’s cheese and Appledores apple salad, served with buttered fresh-baked bread. Little Delving: Fried catfish cakes, served on crisp lettuce with a dollop of sour cream mixed with a twist of lemon. Michel Delving: Thin slices of cured beef, sprinkled with fresh-picked herbs and drizzled with a light mustard sauce. Waymeet: Lemon and thyme butter-basted roast Brownlocke chickens, served with fresh boiled taters, steamed veg and gravy. Stock: Crisp-fried golden perch, served with stewed dill taters and a wedge of lemon. Budgeford: Tender slow-roasted pork with apple and lavender sauce, served with crisp crackling and roasted taters. Brockenborings: Warm mutton and mushroom pies, served with mashed taters and thick gravy made with a healthy splash of apple brandy. Frogmorton: Treacle and ale tart, made with a gentle splash of Toad’s Tongue Ale and served with whipped cream. Woodhall: Berry trifle; creamy goodness with wild berries from the wood, sponge cake and whipped cream, sprinkled with crushed gingernut biscuits. Tuckborough: Slices of the Thain’s favourite caraway seed cake, served with a glass of the Thain’s favourite sherry. Naturally, ales, wines, cider, brandy and tea is served all night. And, obviously, sherry. Enjoy, hobbits! See yer in Bywater on Friday! Potty and Pycella like this. I was looking for a suitable clip of the current lineup, and found this from 2012. Hah, Ric and Peggy are wearing the same Cropredy t-shirts as they did tonight! I hope they clean them occasionally. Lina, Simbo, Pycella and 2 others like this. And the Badgers, preparing for the next ten years! Simbo, Potty and Lina like this. Master Shabe made a few moving drawings from the night! Pycella, Pennyroyal, Rubellita and 1 other person like this.